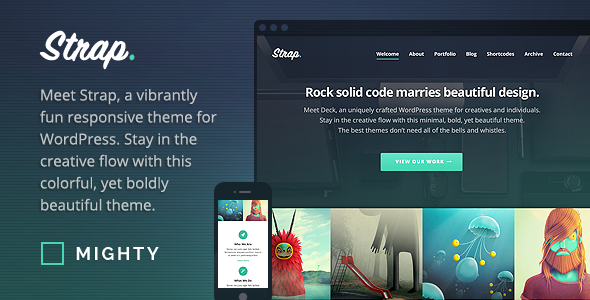 Strap is a creatively fun WordPress theme for businesses, creatives, and agencies.Whether you are viewing Strap WordPress theme on a Retina device, a HDPi device, or even a XHDPi, rest assured your site will display brilliantly at optimal resolution. 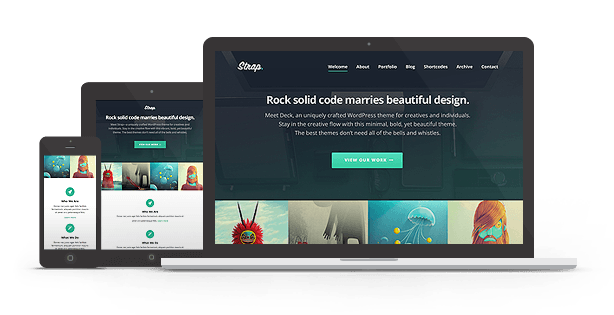 Strap uses no bitmap based images.Theme is included a separate plugin that allows you to easily create and manage portfolio projects. With Strap, you can post any type of portfolio work, including: images, slideshows, audio, and video (both self-hosted and third-party). Custom Widgets — No more boring sidebars, or messing around trying to get third-party plugins to play nice with your new theme. We’ve now included a host of widgets baked right in: Twitter, Instagram, Dribbble, Vimeo, Flickr, social links, and more. SEO (Search Engine Optimization) — We’ve really gone the extra mile with SEO in Strap. Not only have we integrated all of the standard best practices, but we’ve went ahead and implemented all modern HTML5 and Schema.org recommendations.